(TibetanReview.net, Jun01, 2018) – Tibet’s exiled spiritual leader, the Dalai Lama, has, on May 30, referred to support the middle way policy for resolving the issue of Tibet initiated by him in the 1980s had received from a large number of leaders and others in the international and Chinese dissident communities while addressing the 613 participants in an international conference on this policy on the Tsuglagkhang courtyard at Mcleod Ganj, Dharamshala. The middle way policy seeks autonomy, not independence, for a united Tibetan territory within the People’s Republic of China. Beijing, while strongly questioning aspects of this policy, has still vowed never to hold any discussion on it, saying no Tibet issue existed to be resolved. “The guiding spirit of the Middle Way Approach is the pursuit of a mutually acceptable and mutually beneficial solution through dialogue, in the spirit of reconciliation and compromise. We resolved not to seek the separation and independence of Tibet but to strive for a solution within the framework of the PRC,” the Central Tibetan Administration quoted him as saying on its Tibet.net website May 30. 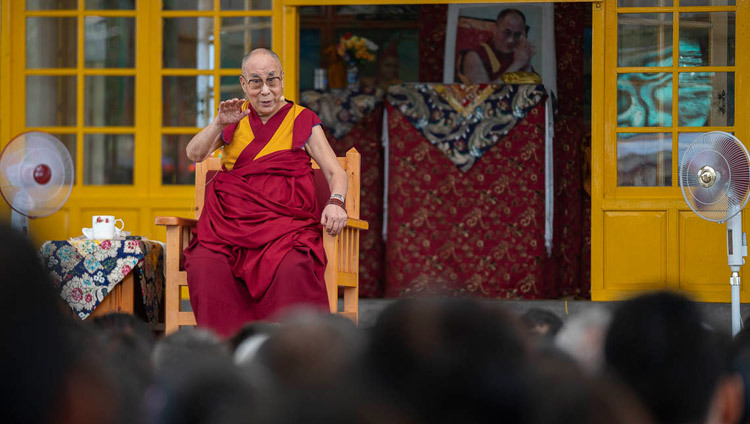 The Dalai Lama has said the climb down from calling for Tibet’s independence had resulted in a direct meeting between the Chinese paramount leader Deng Xiaoping and his personal envoy and brother Gyalo Thondup following the former’ invitation in 1979 to discuss anything but independence. “As a result of this direct meeting, we have had successive fact-finding delegations and representatives who visited many areas of Tibet. The contacts have also allowed Tibetans in Tibet and in exile to visit each other”. He has spoken of the establishment of unity between Tibetans in Tibet and exile as one of the most important achievements of the delegation visits and of the middle way approach. He has also spoken of the middle way approach having received endorsement and solid support from a large number of Chinese scholars, activists, writers, public personalities, including in the form of some 1,000 articles and opinion pieces written by Chinese scholars and writers. He has also said the middle way approach had received support from many governments, including the USA, India, Great Britain, France, Germany and Australia. “President Barack Obama particularly released a statement after our meeting, expressing support for the Middle Way Approach,” he has said. Envoys of the Dalai Lama and Chinese officials last met in Beijing in Apr 2010 and it ended in an acrimonious note after the Tibetan side presented a detailed autonomy proposal and a follow-up explanatory note to it. There has been no contact between the two sides ever since.